This method of cooking salmon is easy and does not require a fish kettle, just a roasting tin, but the results are stunning. This is a perfect centrepiece dish for Boxing Day. Cut a double thickness of foil 1½ times longer than the salmon. Butter the foil well. Put the fish into the centre of the foil, belly down (ie dorsal fin on top, as though it were swimming). Sprinkle over the lemon zest and juice, herbs, wine and pepper. Tightly wrap the salmon, taking care not to squash the tail. Place in a large roasting tin, curling it to fit. Calculate the cooking time allowing 15 minutes per 450g, plus 15 minutes. If the salmon is over 2.5kg, allow 10 minutes per 450g, plus 10 minutes (larger fish need less time as they continue cooking for longer as they cool). Bake for the calculated time. Leave in the foil till warm. Remove the skin from the warm fish, leaving the head and tail intact. Lay flat and cool completely. Put on a serving plate. 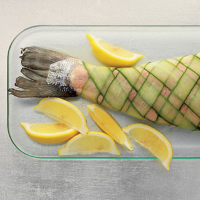 Garnish with a lattice of cucumber ribbons. Serve with lemon, hollandaise sauce and watercress.